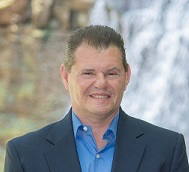 David A. Duryea is business improvement veteran with more than thirty-two years of experience in practical business improvement and technology innovation. He has led more than sixty business improvement and innovation projects in sixteen different industries. As a legal expert witness for failed technology and business innovation projects, David has performed project forensics on failed implementations for over a dozen large-scale projects. 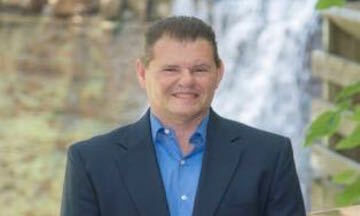 A popular speaker on business improvement, he has been featured at Computerworld, InfoWorld, and industry conferences. His articles in the area of ERP (Enterprise Resource Planning) and advanced technology implementation practices have been featured. David holds a patent from the United States Patent Office, degrees in business administration and computer science, and an MBA with a focus in project management. David is happily married with seven children, four of whom were adopted from China. He and his family live near Cleveland, Ohio. When not studying the intricacies of business improvement, he enjoys hiking, bicycling, baseball, coaching, and investing time in activities with his children. Hugh Ballou: It’s Hugh Ballou again. My guest tonight is a man I met through another person, his publicist. We talked a little bit, and I discovered we had a lot of values in common and we do similar work. We are going to talk about David Duryea’s new book that is out. I have a copy of this book, and it’s really good. It’s 200 pages of really, really well-researched, well-written content. The book is called- I’m getting to the cover. I’ve started reading and I am deep down into it. The cover is a light bulb, and it says Do the Right Thing. My guest on this podcast is David Duryea. David, tell people a little bit about yourself and what inspired you to want to write this really great book Do the Right Thing. David Duryea: Well, first of all, Hugh, thanks for having me on again. It’s been a great conversation and connection with you as well. 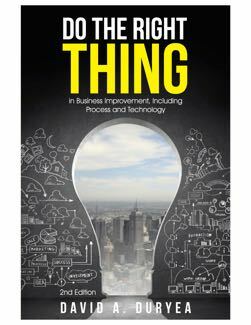 Basically, Do the Right Thing is doing the right thing in business improvement, including process and technology. I would have to say that I came up with the idea, or at least the inklings of the idea, somewhere around the late ‘90s, believe it or not, when we were in the heydays of putting in a lot of different technologies. Dot coms were coming up as well, and we were doing a lot of implementations. I also saw at the same time a very high failure rate. Some of my background is integrated in that. Not only have I been working in this industry for almost 32 years—I have done a lot of researches, I have been on over 60 different implementations and projects myself—I was also called on the courts to be an expert witness for failed projects. What that means is I was in project forensics. I would go in, figure out why the project died, what caused it, and where the bones were buried. I wrote the reports and submitted it to the courts. During that process, there was a lot of things that came to light. I saw a lot of different failures, and I also saw a lot of different reasons. What happened was all of those projects converged into a similar idea and concept. Those are the concepts I have highlighted in the book. I put a lot of these concepts into different phrases so people could really understand them and use them in their insightful way. The first thing was the law of business reality. The law of business reality is how an organization is created basically to serve their customers in a profitable way. The law says that if you don’t serve your customers in a profitable way, you will cease to exist. All organizations are under that principle, that law if you will. A core business model, which is a big part of the book, is a subset or derivative of the law of business reality. That is an organization serves its customer uniquely in its industry in a profitable way. Every organization needs to understand exactly why they are there, how they serve their customers, and how they do that in a profitable way. If you cannot serve your customers, and you cannot be profitable in some way, then you will cease to exist. Hugh: You say in the latter part of the book that “You understand how crucial it is to have a good understanding from the law of business reality to your organization’s own core business model to a sound, functional, and cost-effective enterprise establishment strategy. It is a cascading relationship that starts with the essence of the organization.” “It is a cascading relationship that starts with the essence of the organization.” That is a profound paragraph. David: Hugh, the core business model is what an organization is all about. It transcends all the mechanics and knowledge and things people want to do with their business. It is the heart of why you’re there. Very successful organizations have those. If you look around at the most successful what I would call start-ups or large organizations, like Apple, Netflix, FedEx, even Amazon right now. Amazon is really in the news right now with what it did with its acquisition that it’s impending on. They know exactly who they are, how they serve their customers, and the customers themselves know who they are and how they will serve them. When you have that essence, when you really understand yourself—you are not just going through the motions of “Hey, this is serving up a service or a product, and here you go,” but you really have that passion for it—then your organization emulates that as well. The connection point between the core business model of the organization, all of the operations that need to activate if you will your core business model, all of that is- In the book, it is described as three major pieces: your marketing and sales, your product or service development and delivery, and your administration to support those. All of those have different activities and processes that they need to go on. The essence is something that permeates all of those things. The core business model turns into core business processes, and then they also turn into core business enablement. And we discuss that all the way through the book so you understand when you buy a certain type of technology, if it doesn’t further your core business model, then you will have a real problem serving your customers in the way they want to be served. Just to give you a quick idea, Hugh: When we were doing implementations, one of the root causes of the failures was because they actually purchased software, which is called ERP software, that was really designed for a different industry than the industry they were in. For instance, this was a distribution company, and they bought software that was about manufacturing. Those were a mismatch; therefore, the software didn’t fit them real well. The project failed. In this case, the project failed, and it brought down the organization. It literally sent the company into chapter eleven. Hugh: Oh my goodness. You talk about that as well: “You can see the direct relationship of how it affects not only your business, but also every business. It’s the reality-based improvement that so many organizations seem to try to ignore or circumvent. Now that you have the insight to the misguided leadership styles, failed establishment initiatives, and disintegrated operational models that have led to failed projects and bankrupt companies, you in turn have the methods to directly drive your company to be one of the industry leaders.” How did you come to the essence of all of these moving parts? There are a lot of them, and you address all of them in the 200 pages of this book. I find it easy to grasp because it is laid out so cleanly. I hate books that are all just copy, but you have it laid out so it’s really easy to grasp the concepts visually, which means in my simple mind, I can internalize it. Tell me about your background of how you assimilated all of these components and put them together in this really good book. David: Because I was not only doing the implementations for business, but I was also doing forensics, I could see it from both ends. I was speaking not only to people that were in the operations side, but I was also speaking to the business side and boards of directors and investors. It gave me such a broad-based perspective of exactly every level of the organization and which level has an impact or influence on it. I also spoke to some customers. I also got the unique perspective of understanding how the customers looked from the outside in, and also from the management and leadership from the inside out. Because of that broad base or that holistic viewpoint I was able to glean out of so many different engagements, I was able to clearly put all of these concepts together, and also I saw how they all connected and they were all holistically and synergistically connected. Hugh: I like that word “synergy.” My company, as you may know, is called SynerVision. I took Synergy and Vision and put them together. As you may also know, I spent 40 years as a musical conductor. We create the culture of high performance, which we call ensemble. SynerVision is what resembles ensemble in a culture that is not a music culture. What you talked about, about your core model, I relate everything to the orchestra, the choir. There is a core model for how we function. It is a very high-performance model. You either cut it, or you don’t play. It’s a very high standard indeed. I’ve yet to find that kind of standard in any other organization that I work with, whether it’s a mid-cap organization or a smaller nonprofit. I don’t find that system anywhere. This core business model driving to higher performance, expand on that a little more, if you think there is some synergy with what I just talked about. David: Absolutely. I have been nowhere near the level of music talent that you’ve been, but I certainly have played an instrument. I was all the way through college in the marching bands. If you can’t play in tune, you’re out. You know it instantly when someone is out of tune. You’re always nudging the guy next to you and saying, “Hey, what is wrong with you?” In the same side of it, in the marching band, if someone isn’t in line, you know that, too. In fact, the whole audience sees that. The idea of the core business model is exactly what you said, Hugh. It actually is not only the essence, but it is also the goal. It gives you the idea of exactly what you need to do. As you say, you’re a conductor. Everybody in the orchestra needs to look at you. Everybody needs to know where they are in the music. Everybody needs to know what’s coming next. It’s the same thing as the core business model. Everybody understands what it is they are driving for. This is the model; this is the goal; this is what we need to do. They all know their places in the organization, whether it’s in the process of marketing/sales/service; administration; or service/product deliverability. They all know their individual roles, and they all know how they fit together so the whole operation runs at the same time. Believe me, Hugh, they know when the sales and marketing isn’t in sync with the product deliverability because someone is overselling the features or just the product itself, the features aren’t doing what they said they did, and it’s not in alignment with the core business model. All the way down to your attorneys. If your attorneys are not expressing the contracts they need to, it emulates who you are at a core business model. All of it together is either in sync or out of sync. And guess what? Your customer is going to know immediately. Hugh: That is so critical. Under your business improvement model on page 162 in your book, step one under part one of the Business Strategy Structure, Understanding the Law of Business, the footnote, the description underneath it is, “The organization serves customers in a profitable way (balance, quality, and efficiency) or cease to exist.” In the next one, Understand the Target of the Core Business Model: Why Organizations Generate Profit Differently from Their Competitors. We want to serve customers in a profitable way. It’s really the balance that is important. Talk a little bit more about those. We get off track. Some companies are so focused on profitability at the expense of the customer experience that it really hurts their company. Talk about this balance a little bit under the law of business. David: That’s a great point, Hugh. The whole idea of the core business model is about balance. You have to serve your customers, and you have to earn profits; otherwise, you are not sustainable as an organization. You cannot continue to serve your customers in the way they would like if you cannot make the profits that you need. At the same time, we know you have to earn some sort of profits not only to maintain but also to pay all of your expenses and to earn a little bit of investment. You have to have some investment; otherwise, you can’t be sustainable. At the same time, if you take advantage of your customer, or even basically take them for granted, I see that so often in businesses. Taking a customer for granted, that they are always going to be there. Well, because of the invent of all the things of social media, online purchasing, it will take you all but 30 seconds to lose a customer. In the book, I actually highlight the cost of losing customers and how that has an impact and how much of an impact on market share and things like that. You definitely do not want to take advantage of your customer, and you certainly don’t want to take them for granted. That takes a lot of effort and investment on the other side. You have to be efficient at serving that customer. If you are not efficient, you won’t be profitable enough to serve your customers in the way they expect. The balance is constant, where you are constantly trying to serve, constantly trying to be efficient, and constantly trying to do both at the same time. If you don’t keep that focus of constantly balancing, one of them is going to get out of balance, and then you are going to start to slide into unprofitable situations or you will lose market share and customers will run to a competitor who is serving them in the way they want. Either way, it’s going to slide the company into probably dissolution. Hugh: Absolutely. You should send a copy of this book to the major airlines. Let’s let that one slide. How does focusing on an organization’s core business model help drive higher performance? Going back to the musical analogy, to me, the core of who we are is our performance. It’s not the theory of what we do; it’s how we actually perform the day-to-day operations. We do make a profit because we provide value to our customers. How does focusing on this core business model drive higher performance? David: The first thing you want to do is understand why you are serving your customers, why they are coming to you. It’s not, “Hey, this is what we’re offering you. You need to come to us.” That’s not the way it works. The way it works is the customer says, “Hey, you’re serving me in the way I want. I like that, and you’re giving it to me for a fairly good price that I can work with.” The idea is the performance side of it is first you have to lay out how you are going to serve your customer. From that, there are processes and functions. You also need to enable those processes and functions. The number one enablement right now is technology, as everybody knows. Technology is a big deal. But the issue is now technology is extremely expensive. Furthermore, it can be complex to work with. The company needs to keep a very good focus as to what kind of technology they need and their own customer value. When you are driving in performance toward the back end of the book, I have actually laid out how you can measure the performance of the processes in something I call core business productivity. There is a way you can measure that and then compare that with a new operation you want to put in. That is a good way for most organizations to understand whether a new piece of technology, a new vendor, or even a third-party outsourcer—I am constantly being asked if we should keep something in-house, or should we give it to a third party? Remember this. Any time you take a particular function and move it outside of your organization, it is going to dilute your core business model because somebody else is doing it. If there is a way you can maintain that, then it’s fine. But most of the time, if you keep it in-house, you have total control, but it could be more expensive. So you are constantly balancing those pieces of how you are going to enable your process and your operations to perform it in a higher way. Performances can be measured in the core business model productivity. This helps you understand what keeps you in balance all the way through from the top part of the organization down to the lower ends, where you are actually in contact with your customers. Hugh: Productivity = F:E. Is that the shortened version of it? Core business productivity = Core business model functionality and efficiency performed. David: Yes. It’s basically functionality times efficiency. The reason why it’s laid out that way is that the functionality piece is the functions you want to perform for your customers. It’s literally what it is that needs to get done. The efficiency side is how efficient are you at performing those functions. That’s the balance. You have these functions that need to be done, and the efficiency, how well you are performing those functions. If you multiply those two together, then you get what is called productivity. If one goes out of balance, meaning you are not doing the functions you need to, then your productivity goes down. If you are not doing the functions efficiently, then your productivity goes down. See how those balances balance out? Hugh: Yes. What I was thinking is this ought to be mandatory reading for anybody starting a business. We get off track because we look at the existing models of ineffective, inefficient productivity and not really valuing the customer experience. I guess you are familiar with the Gallup poll that says 70% of employees are either disengaged or actively disengaged. Hugh: Which adds to negatively impacting their performance. David: Exactly. They are not- I’d love to be able to do some research on that to peel back the layers on the onion here and try to understand why that 70% exists. Why is it so persistent out there? I bet you those people are not connected to the organization’s core business model. They are not invested in what’s going on. They don’t seem to understand how they fit into the tonal model. Hugh: My experience is you’re spot-on. I do the people part of that. How do we integrate it into performance? It’s the culture piece that I work with. We call it leadership, but very few people understand leadership. What you are giving us is a solid framework to educate us on what it should look like and how we measure it. I am going back to if we are starting a business. A lot of people start a business, and many of them fail. Dunne and Bradstreet said 90% of entrepreneurs fail because they don’t have the skillset to run a business. They call it manage-to-manage. It’s leadership, and as John Maxwell says in The Law of the Lid, the organization can’t go any further than the leader’s ability to lead it. What you are giving in this book from what I have seen—and I have not digested it, it’s a lot of really useful content that I was not willing to rush through, but the parts that I have seen I resonate with a lot. Your listing of citations in the back, your attributions, you did a lot of research in addition to your own personal experience. So it’s not just you shootin’ from the hip. It’s well-thought out, well-researched. It took you five years to put this together, I believe you said. David: It took me five years to write it. Again, it was a part-time thing. But it probably took more like 15 years to actually be able to solidify and legitimize all of the concepts in the book itself. But yeah, it was pretty rigorous, but I wanted to be comprehensive. I wanted it to be something a business leader or someone in the trenches could pick up and say, “Okay, I understand this piece. I know how this works for me.” Like you said, it is step by step. It is like a handbook, but also something people can pick up and understand the concepts and how those concepts fit in their own organization. Hugh: I found that to be very true. What do you see as the major issues as to why organizations do not perform or projects that do not attain the target of performance? David: Well, I would say the biggest reason is the leadership really doesn’t understand their own core business model. This one, Hugh, was a big revelation for me. I even have a story in the book of how I sat down with a business leader and asked him the question, “So why do the customers buy from you?” And he said that I was the very first consultant that ever asked that question of him. He said many consultants come in and talk to him about all kinds of performance models and analytics and things like that, but I was the first one to ask him why the customer buys from them. Instinctively, he knew his core business model. It was a private organization, and a lot of private organizations know that instinctively. A lot of leaders and organizations do not understand their core business model, and they get into some ideas how they want to expand the company. They don’t even realize some of those initiatives go against their core business model. That is very problematic, and we have seen that a lot. The first thing is why do businesses or some project initiatives fail? That is because they don’t understand how those initiatives are going to affect their core business model. I would say the next thing is the companies don’t understand how their own products and services fit into their core business model. One of the great cases I would think of is the Apple computer. If you think of the history of the Apple computer and what they have been able to do, and they have changed a lot over the years, but what hasn’t changed is their core business model. People don’t even realize this, but they take technology and make it simple. That’s what they do. On top of that, they make it, if I will, cool. And that is how they have been able to add on all products, not just computers, but also their phones, their pads, their iPods. Everything they do is all about taking some technology and making it easy to use and then making it real fun. They really understand their products and services and how all of their products would fit inside their core business model. I would say another big one is the misnomer that technology will automatically further an organization’s core business model. Not necessarily. You have to get the right kind of technology. The next one is the big one I work with almost every day. That is innovation will automatically further an organization. Those two sound a little bit the same, but they’re not. There are all kinds of innovation that comes out, but sometimes organizations don’t necessarily mesh with the innovation itself. Here is the biggest one of all: Organizations that don’t even realize that their industry has been changed by innovation. They don’t grasp that. Hugh, that dovetails very much into what you do with leadership and the skills and things you are talking about. They didn’t have the skillset to realize what the impact of certain innovation is going to be on their organization and in their core business model. I see that a lot these days because these things are changing very well. Hugh: I agree with you. It’s partly that leaders don’t understand their role and the consequences of their actions. They think they have to be the boss. They have to make all the decisions rather than using the expertise around them. I bought a little camera store in Florida and grew it from $12,000 a year to $1.4 million and owned commercial photo in that part of central Florida over the years. I had five distinctly different Kodak dealerships. At that point, Kodak owned the imaging business. They were the big guy on the block. They totally ignored Fuji and the innovation of dealership. As you know, they ultimately went into bankruptcy. Now they are just a very different minimal player instead of a major player. The leadership was really blind to the status quo. This innovation thing can really distract you or not. It can kill you. That’s a huge point you just made. Hugh: I’m curious: What instrument did you play? Hugh: Ah! I won’t tell you my trumpet player jokes because you will probably come back with conductor jokes. There is some synergy in the core business model and the orchestra; I want to use an orchestra because there are so many different kinds of distinct personalities. Brass players are very different from the woodwinds, for example, would you say? Hugh: So the leader nuances all of those, but your core business model is your culture, and your core business model is the structure, which is a very analytical, highly mathematical structure, which then provides the basis for structure to be created. In that core model of the orchestra, we have the strategy of the music itself, the piece of paper, but it’s the connection and integration of that and performance that really makes something happen. The core business model and the understanding of it is what’s missing and the different players understanding their role. We serve the music, we serve the client, which is the audience. We focus on what makes a good user experience. Is there an analogy there that fits what you’re talking about? David: Absolutely. What you are talking about, analogies with music, and we were talking the other day about that- it really does fit similar to that as well is that the model itself gives the goal of where the organization wants to go. The other people, as in musicians, know how to play that instrument. They need that sheet of music to know how they fit altogether. If they fit altogether, and they are doing the right thing, they sound fantastic. If they don’t, then we are out of tune, out of key, and some are coming in when they are not supposed to come in on the music. I only make that analogy because I had a professor constantly tell me- He was a stickler for making sure you were coming right exactly on the downbeat where you should be. And he knew, within milliseconds, or that’s what it seemed like, whether that was accurate or not, but all of those things together, if you don’t come together, then you sound awful. Just like the core business model, if you don’t have everyone together, which sounds like an amalgamation of the culture and the structure and operation all working in concert together. When they do, then it’s working very well. You will be able to instinctively know how to serve customers and balance that quality and efficiency that you need to maintain profitability and sustainability. Hugh: This fits my podcast “Orchestrating Success: Converting Passion to Profit.” The profitability, as you said earlier, drives what we do. I am amazed at how many people don’t realize that even in charities we have to make profit. We are focused too much on profit, or we don’t do that critical balance that you talked about. This is helpful. What steps can an organization take to help improve their performance? David: Well, the first thing they need to do is they need to implicitly understand their own core business model. If they don’t know, they need to figure that out so they can figure out the effects on the operation itself. Once they understand that, they need to understand exactly how their profit generation is tied to their core business model. They need to understand that customer and why they are buying from them. They will be able to understand how that is affecting the model and the generation itself. I really think that businesses need to constantly review industry trends and changes that might impact their core business model. They need to sift them, if this is really moving this or if it’s not. Further technology and innovation, or even a lot of it, is- what about a disruptor? A particular company that is coming in and they look like the start-up, father/son, if you will, and they come up and all of a sudden they dissipate out. An organization that understands why their core business model is there and why that customer is purchasing from them will understand whether a particular disruptor is going to impact them or not. So organizations need to really understand the disruptors and any new innovation and technology that is coming in and sift that with their own core business model. They might need to make the moves, to make the changes. Right now, there is a huge change in what we call the financial advisory industry. Those organizations are starting to really feel the impact, and actually a number of them are starting to file bankruptcy because they did not change, from the impact of how innovation is making it move from an active management model to a more analytical and technology-driven model to reduce costs and make them more efficient. Huge changes that are going on in there. That is just to name one of those impacts. Those pieces themselves constantly looking at what their core business model is, why customers purchase from them, how they can constantly improve that model, and further their customers is the best way to understand how to improve the business. Hugh: This brilliant book that you’ve created, Do the Right Thing of Business Improvement and process and technology. How does the book help organizations to improve? Where can they get the book? David: Okay. The way that it helps them be able to improve themselves is the book is laid out, as you mentioned, Hugh, in a step by step process. It is organized in three areas from top to bottom. It goes from the strategy side to the process of execution side, and then it even has a section on enablement, which is how to evaluate resources for your organization. Basically it goes from A to Z. You can pick it up and read it, and with the stories and research in there, I try to make it more interesting than just a book of definitions, then hopefully you can pick it up and understand the concepts a little bit better. Where they can get the book. It’s on Amazon, Barnes and Noble, and my publishers’ website at Westbone.com. It is under the name Do the Right Thing of Business Improvement with my name of David A. Duryea. The other thing they can do is if they like the book and some other resources out there, then they can go to my website, davidaduryea.com, and out there, we highlight those core business model ideas. We have other resources that folks will be able to download, a bunch of white papers, if they are interested in strategy, innovation, and even disruption. Hugh: Love it. David Duryea, you have created a book that should be a standard in anybody’s business library. It’s not only a learning experience, but it’s also a good reference tool to go back to to keep current. I suggest to clients they get good books like this and they read it through with a highlighter and then six months or eight months later, go back and read it again with a different colored highlighter. We find that we have learned enough that we are ready to learn the next thing. This book has enough depth to it that there is more to learn when you go back and review the content. It’s many years of sweat, and it’s really practical advice. Practical content. And very usable content, I find. Thank you for sharing your wisdom with the listeners of Orchestrating Success. We are people who are making a difference in the world, and it’s content like this that empowers us to make a difference. As we close out this interview, is there something we didn’t cover that you’d like to mention briefly? Finally, what is a tip or thought you’d like to give people as we do a summary at the end here? David: The one thing I wanted to do is to make sure that your audience understands that the core business model- There are a lot of ideas, but the one takeaway they have is understanding a core business model in their organization is to serve the customers in a profitable way. They keep that in the forefront of themselves. This is the tip: always keep that in the forefront. Every time you think about an improvement or something you want to do to add a product or a service, keep that in the forefront. Your organization will not get off the rails. It will keep to the core business model. I believe they will be able to sustain a high level of success in all they do. Hugh: David Duryea, thank you for sharing your wisdom with our listeners today. David: Thanks for having me, Hugh. It’s been my pleasure. Thank you so much. Step 1 Understand the Law of Business Reality Organizations serve customers in a profitable way (balancequality and efficiency) or cease to exist.